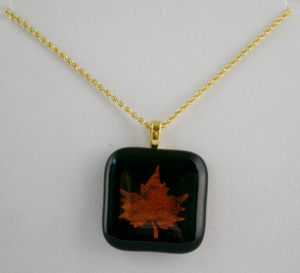 The maple leaf pendant is about 4 cm square. It is made by fusing a piece of black glass with a piece of clear with a punched out leaf of “dichroic slide”. The dichroic is very thin layers of metal oxides that are put onto a piece of shiny paper. After punching out the design, it is soaked in water until the ultra fin layer slides off like a transfer. It is then carefully put onto the black glass and capped ith the clear. It takes considerable skill to avoid losing parts of the leaf.